Emerging architectural practice Tecture’s Concrete Conceal house is a finely resolved success for client and architect, and a triumph of beautiful design. 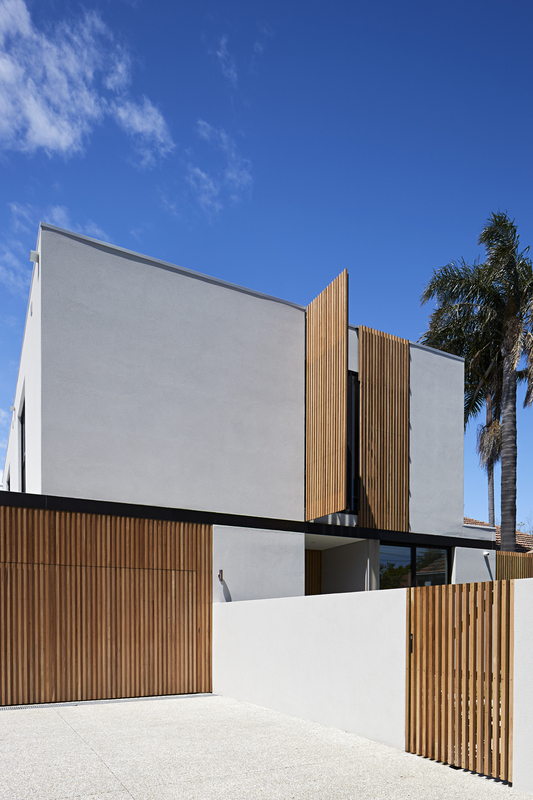 As a new build, Concrete Conceal house is a glorious modern interpretation of a family home that marries functionality and form with a pared back aesthetic to achieve a stunning result. The project is a credit to Ben Robertson, Tecture’s principal who, along with his team, has captured the vision of their client and delivered a project that enhances site and situation. The overarching driver of this project are the clean lines that delineate and divide areas, concurrently enhancing and complementing the exterior and interior to provide a geometric design continuum. The building itself is encircled by a bronze ‘ribbon’ that wraps and envelops the exterior and it is this feature that is constantly repeated as detailing throughout the house – inserted into cabinetry and stone fixtures and further extrapolated in furniture and fittings. 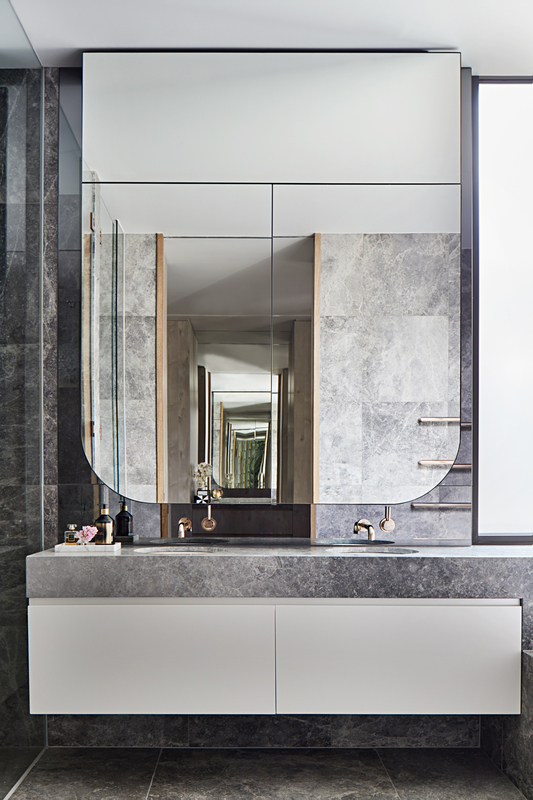 The material palette is restricted but refined; primarily metal, stone and timber and white, taupe, mink, gold, rose gold and black combine to create a colour palette that is low-key, but perfectly nuanced for place and application. 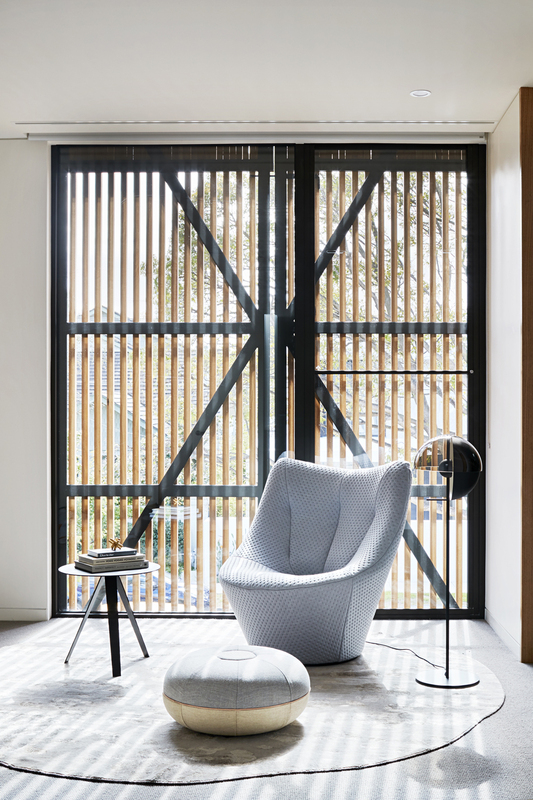 The interior plan of the 500-square metre home is generous with expansive living spaces and well-devised flow patterns that create ease of use within the comfortable interior. The heart of the design is the master bedroom located on the ground floor and positioned in the very middle of the home. It’s an unusual placement; however, as a close family, the idea was to promote connectivity and community with all family members. The floor plan flows perfectly with garage, entry and a study/bedroom at the front of the ground floor and master bedroom suite, kitchen, butler’s pantry, living, dining and outdoor space at the rear. The first level includes three further bedrooms and en suites, plus a gym and rumpus room and this becomes an intimate sanctuary for the children and their friends. Throughout the ground floor pale oak timber flooring (Woodcut) has been laid, while upstairs carpet has been included for warmth and texture (Troika, Kiev from Cavalier Bremworth). The bedrooms have been designed simply, with all amenity. 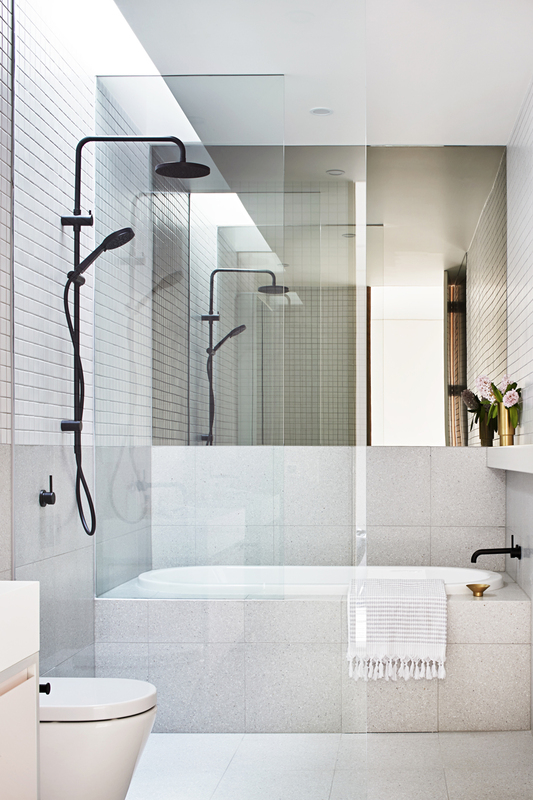 The bathrooms, however, feature striking black fittings against square tiled walls, but it is the slashes of black that take the design from the ordinary to the special. Metal strips in cabinetry add a slice of bling, and also continue the materiality and the geometry that are integral to the overall design. The master bedroom, en suite and dressing room offer an intimate luxury with floor-to-ceiling sheer drapes on the sliding glass doors that lead to the outside patio and a bathroom that features marble and rose gold fittings. Anywhere else the inclusion of rose gold shower and taps might have seemed garish, but here they are perfectly at home. As the name may suggest, Concrete Conceal house has some secrets to its design and Tecture has cleverly concealed amenity that is hidden away wherever possible. Facilities such as the laundry, dry pantry and storage areas are definitely back-of-house and are accessed through doors in the wall panelling. This ensures that all food preparation is out of sight and that the open plan kitchen and living areas are clean and clear whatever the time of day. To make the most of the public spaces, the outdoor patio that sides both the master bedroom and the living room has been positioned north-facing with the kitchen directly in front. 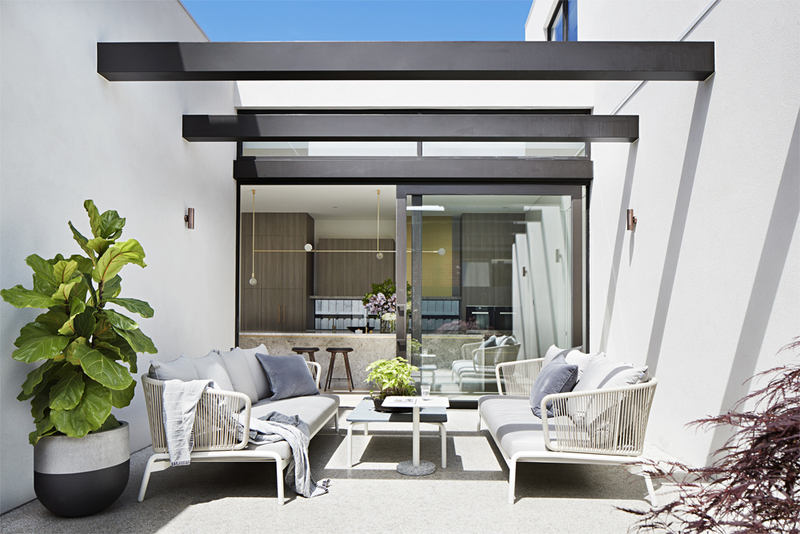 This is a fabulous layout as the patio is incorporated into the entertaining areas, creating another room, albeit outdoors, for entertaining. The open-plan kitchen is dominated by a five-metre long marble island bench and including the metal strip detail here adds a delicate touch and helps fine down the bulk. Overhead is a custom-made pendant light designed by Volker Haug that is size appropriate, but quite ethereal in its structure and the juxtaposition of bench with light fitting is skilful in its composition. The dining room is classic, with fine art and stunning furniture pieces that combine to create a sophisticated and relaxing destination for family and guests. A Kristalia Holo dining table (Fanuli) with its resplendent base is a masterful inclusion and Walter Knoll Saddle chairs (Living Edge) are stunning in their simplicity. A beautiful painting dominates this space (Naive and Sentimental Painting XII by John Young) and lifts the curation of furniture and objets to another level – as does all the art throughout the home. The living room is pared back elegance with a long low-slung marble bench, almost an inverted mantle, placed below an open fireplace that faces a Gio Ponti armchair (Molteni, D.153.1, Hub). 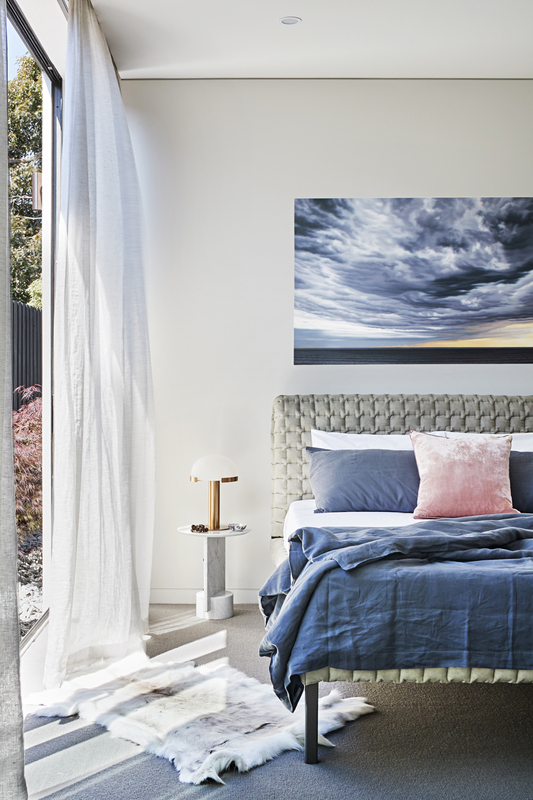 There are ottomans (Domo) and a Cloud sofa (Meizai) and another painting (The Width of a Circle by Agneta Ekholm) that becomes a focal point and serves to enhance the beauty of myriad desirable accessories within this room. 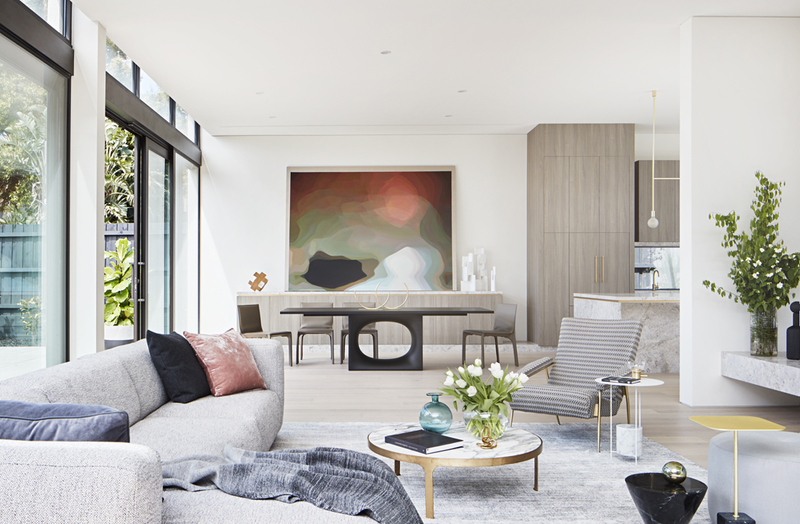 Within the living and dining rooms the ceiling heights have been raised to 3.6 metres, creating an expansive void that adds a lightness and largesse to enhance the relaxed atmosphere of these spaces. Tecture was established in December 2015 and although young is producing outstanding work. With a staff of five there have been 24 projects completed with 75 more on the books. Concrete Conceal house was not an extravagant commission. There was a restrained budget; however, the end result speaks volumes for style, integrity and excellent design. As a home Concrete Conceal house is generous, as a finished project it is exemplary and as an indication of what is to come from Tecture, the future is indeed exciting.